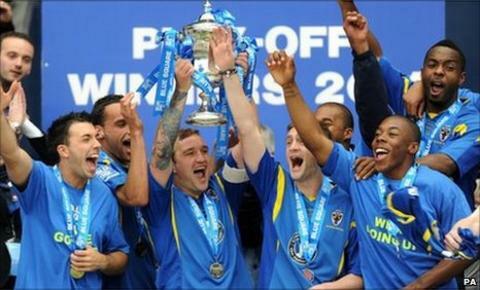 AFC Wimbledon won promotion to the Football League for the first time in their history with a dramatic penalty shoot-out win over Luton at Eastlands. After a goalless 120 minutes, top scorer Danny Kedwell netted the winning kick after Dons keeper Seb Brown saved from Alex Lawless and Jason Walker. Kedwell had an early strike chalked out for offside in a frenetic game. Walker saw a header hit the post late in normal time, while Dons' Kaid Mohamed also struck the woodwork. But ultimately who won the Blue Square Bet Premier play-off final boiled down to a test of nerves, with the Dons, who had finished second in the league table, six points ahead of the Hatters, coming out on top. AFC Wimbledon grabbed the early initiative in the shoot-out as Brown dived to his right to save from Lawless, who was also on the losing York side in last season's Blue Square Premier play-off final. Mark Tyler saved the Dons' third penalty from Mohamed to level it at 2-2, but Brown was the hero again moments later when he got a hand to Walker's chipped spot-kick. With Ismail Yakubu and Jake Howells then on target for either side it was left to Kedwell to smash his penalty past Tyler and kick off a blue and yellow party. AFC Wimbledon, only formed in 2002 when Wimbledon FC were relocated to Milton Keynes, received a pre-match boost with Gareth Gwillim shaking off a hip injury in time to take his place in the starting line-up, while Luton striker Danny Crow was fit enough to take his place on the bench after a knee injury. There was little to choose between the sides in a frenetic start in which both went close from corners before Wimbledon thought they had broken the deadlock. Mohamed cut in from the left and hit a low shot which Tyler palmed into the path of Kedwell, who fired into the net only to have his celebration cut short by a raised offside flag. Brown was called into serious action for the first time with a smart reaction save when Howells' shot took a nick off Walker standing in front of him. His next stop was more impressive, though, as he acrobatically tipped away Claude Gnakpa's drive after the tricky Luton wideman had cut in from the left. And it was Gnakpa who then missed the clearest chance of the half in the 34th minute when he put a free header over the bar from 10 yards after rising to meet Robbie Willmott's free-kick. The second half began like the first, at a high tempo, but both sides struggled to carve out openings as they cancelled each other out. But the game came to life in an action-packed last 10 minutes as both sides went close to a winner. Impressive Dons substitute James Mulley tried his luck first, curling in a right footed effort which Tyler turned behind for a corner. Mulley then won a corner off Dan Gleeson, but when Sam Hatton delivered to the far post Yakubu could only volley wide. Steven Gregory saw his low long-range drive fly the wrong side of the post as the Dons went close again. But blue and yellow hearts were in mouths when Walker went down under a challenge from Brown but referee James Adcock ruled no penalty. Matthew Barnes-Homer and Howells were unable to turn the loose ball home, but Luton thought they had found an 89th-minute winner when Walker met Howells' pinpoint cross, only to see his header hit the inside of the post and bounce into the grateful arms of Brown. Kedwell then had a chance to win it with the last kick of normal time, but he dwelt on the ball too long and allowed Ed Asafu-Adaye time to slide in and block his effort. With the exception of one Lawless 25-yard piledriver that Brown watched fly narrowly wide, the first period of extra time failed to live up to the promise of those closing stages as the contest again descended into stalemate. But the Dons had a glorious chance in the second minute of the second period of extra time when Rashid Yussuff powered forward and fed Mulley, who should have done better than hit his shot straight at Tyler. Walker flashed a header wide from Gleeson's right-wing cross as Luton hit back, before, at the other end, Mohamed was left holding his head in frustration after stabbing Luke Moore's pull back against the outside of the post. But it was the Dons who finished the stronger as Moore poked Kedwell's low cross wide under pressure from George Pilkington, Luton's Gleeson sliced uncomfortably wide of his own goal and the unmarked Yakubu headed Sam Hatton's cross wide with the goal at his mercy to send the contest to penalties. AFC Wimbledon: Seb Brown, Hatton, Stuart, Johnson, Gwillim (Yakubu 61), Gregory (Minshull 94), Wellard (Mulley 67), Yussuff, Kedwell, Mohamed, Luke Moore.Subs Not Used: Turner, Jolley. Booked: Johnson, Luke Moore, Minshull. Luton: Tyler, Gleeson, George Pilkington, Kroca, Asafu-Adjaye, Willmott (Barnes-Homer 61), Keane, Lawless, Howells, Gnakpa (Newton 95), Jason Walker.Subs Not Used: Kevin Pilkington, Graham, Crow.